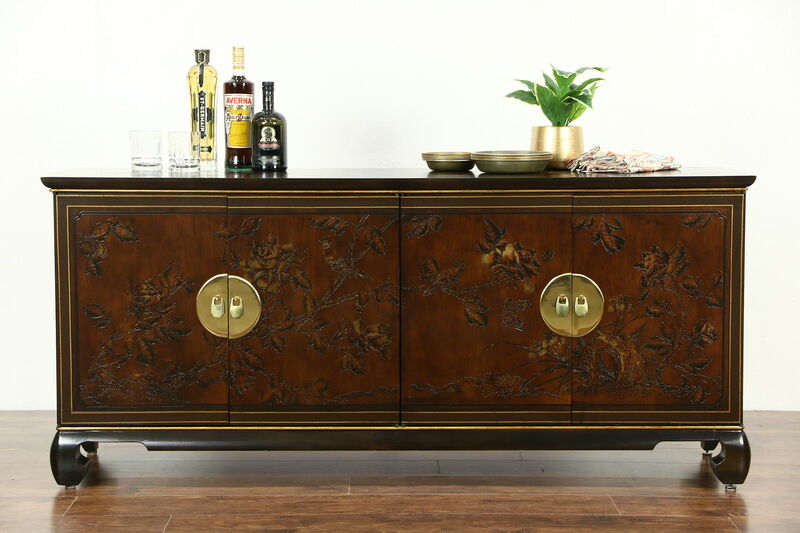 A spectacular Chinese style sideboard, server, TV or hall console is signed by premier maker, "Drexel Connoisseur by Heritage." About 30 years old, the designs are carved and subtly painted on walnut with cherry inlaid panels. The renewed finish is in excellent condition on this American made vintage furniture. Brass hardware is original, inside are drawers with solid oak dovetailed sides. Measurements are 68" wide, 19" deep and 30" tall. The matching dining set and China in photos is priced and sold separately, contact us for availability.